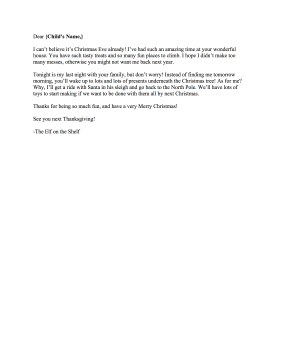 When the Elf on the Shelf leaves a house on Christmas, he leaves behind a goodbye letter similar to this one. I can't believe it's Christmas Eve already! I've had such an amazing time at your wonderful house. You have such tasty treats and so many fun places to climb. I hope I didn't make too many messes, otherwise you might not want me back next year. Tonight is my last night with your family, but don't worry! Instead of finding me tomorrow morning, you'll wake up to lots and lots of presents underneath the Christmas tree! As for me? Why, I'll get a ride with Santa in his sleigh and go back to the North Pole. We'll have lots of toys to start making if we want to be done with them all by next Christmas. Thanks for being so much fun, and have a very Merry Christmas!